This is (roughly) a transcript of my talk at Strange Loop this year! At least, it’s what I meant to say. Watch the video for all the fun Canada facts and nervous rambling. First off, I want to thank the organizers for this opportunity. Strange Loop is such an amazing conference – I can’t believe I fist attended with an opportunity grant two years ago. The friendships and community I’ve built here have been amazing. Hi, I’m Abby! This is me. 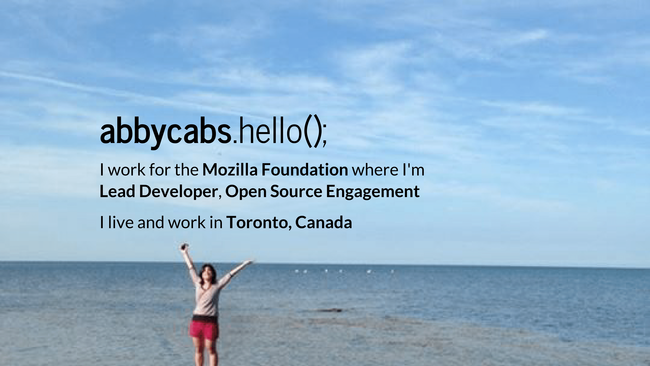 I work for the Mozilla Foundation as Lead Developer of Open Source Engagement. This means I with with the open source projects and community around the different programs at the Mozilla Foundation including Open Science, Internet of Things, Women and Web Literacy, Learning and Advocacy. Also, I’m from Toronto. This is important because Toronto is great. I love watching a community come together to solve problems. The past two years, I’ve been testing ways to engage contributors on open source science projects. As Lead Developer for the Mozilla Science Lab, I built prototypes in the open with our community while mentoring others to do the same. We’ve seen exponential growth in contributorship and mentorship, and I am incredibly proud of the work we accomplished. I’m excited to be moving into a role where I’ll be extending the contributor pathways we’ve built in the Science Lab to other programs within the Foundation. As Lead Developer, Open Source Engagement at the Mozilla Foundation, I will be shaping how we interact with the open source community not just in Science, but also in Learning, Internet Policy & Advocacy and newer efforts like Internet of Things and Women & Web Literacy. Three weeks ago, I left the Ontario Institute for Cancer Research (OICR) to join the Mozilla Science Lab. Yesterday would have been my five year work anniversary at OICR. Since I don’t get a plaque now, this seemed like a good time to reflect on what I’ve learned as I begin a new chapter at the Mozilla Science Lab. Majority of my time at OICR, I served as lead developer on the WormBase project. I learned a lot about software, leading development teams and dealing with biological data; But my biggest takeaways came from watching the interaction between the scientific research community and the web. Joining the Mozilla Science Lab! 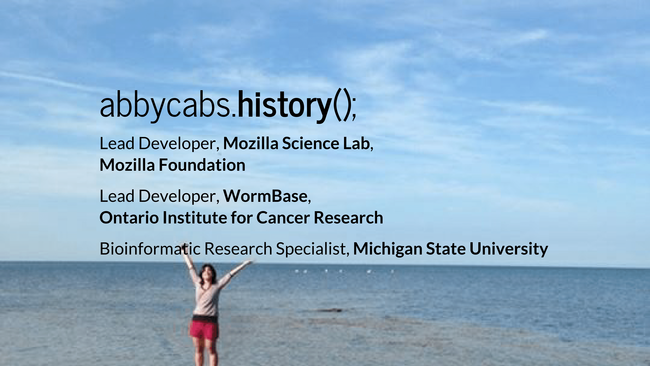 Breaking news: I’ve joined the über-talented team at the Mozilla Science Lab as lead developer! I’ll be leading technical prototyping efforts and engaging the community about our technical projects. The Mozilla Science Lab is a new initiative that will help researchers around the world use the open web to shape science’s future. I have unashamedly fallen in love with the ideals of open source and open science. I’m enamored with what openness means and what it could look like in the scientific community. Biocuration is incredibly important to progress in science. The process of sorting through and annotating scientific data to make it available and searchable to the public is at the heart of the ideas behind open science. I work at WormBase because I believe in its mission to curate our knowledge of nematode biology to make it freely available to the scientific community. The Seventh International Biocuration Conference (ISB2014) was held at the University of Toronto last week. The theme of the conference this year was “Bridging the gap between genomes and phenomes”, focusing on bringing the results of the biocuration efforts to the clinicians. However, a slightly different theme stood out to me during the meeting - the tension between different methods for improved curation. The Seventh International Biocuration Conference (ISB2014) begins tonight here in Toronto. WormBase (http://www.wormbase.org/) is a highly curated central data repository for Caenorhabditis biology. Our objective is to capture the wealth of experimental data available from C. elegans and related nematodes via published literature and personal communication, and present it to the research community in a way that facilitates new biological insights. Although the website is geared towards end users, we added several features to support the biocuration process.